California Zinfandel wines produced from "old vine" vineyards may be hiding something from you. Your favorite "old vine" Zin may be hiding its specific varietal makeup. There's nothing particularly subversive about this, though. Think of it as "throwback winemaking." Most Zinfandels that are produced using grapes sourced from vineyards which have been around since the late 1800s or early 1900s are actually field blends. A field blend is a wine made from two or more different varietals that are grown, harvested and fermented together. The co-fermentation occurs in a single tank, with all the varietals contributing their different components to the wine at the same time. If this sounds like a novel idea, consider that this was once the standard in California winemaking. The earliest vineyards in the Golden State were planted by Spanish missionaries. They would plant a vineyard whenever they built a new mission so that sacramental wine could be made. The first grapes were termed Mission grapes, and they were brought from Mexico. As the Gold Rush brought new settlers to California in droves, the wine industry expanded along with the population. European immigrants planted their vineyards to field blends as they had done in their homelands. Italian winemakers were particularly influential in California beginning in the 1880s. Zinfandel, which bears a familial resemblance to the Italian Primitivo, is actually descended from Croatia. Zin was the prime grape in California for many years, and is a primary facet of many field blend vineyards. Any "old vine" Zinfandel wine produced in California is almost assuredly a field blend of several, or even many, varietals. Recently I had the good fortune to continue a conversation with Jim Rickards, of J Rickards Vineyards and Winery in Geyserville. It was a conversation that began this summer when I visited his winery and tasting room on a press trip. There were about a dozen of us at the time, all clamoring for a few words with the lord of the manor, so our talk was short and finished with a promise to continue when we both had the time. The topic of our conversation was decided in the tasting room, where Jim poured some of his field blend red wine for the group. I have long been fascinated by field blends, and spoke with the cattleman-turned-farmer-turned-winemaster about this historic winemaking style. "A field blend," Jim explained, "is a wine produced from a vineyard where several different varieties of grapes are grown together. Those varieties are comingled throughout the winemaking process. It's the goal to do this. Those different types of grapes are grown together, harvested all at the same time in their varying degrees of readiness and fermented together into a finished wine." Some field blend vineyards are planted orderly, in a row-of-this-row-of-that fashion. Others are more haphazard, with different varietals growing next to each other in rows. Today, Blends are typically made from different wines that are produced separately and mixed together after the fact. But that wasn't always the case. "No. Around turn of century it was common practice to plant field blends. Most older vineyards you see today were planted to field blends originally. A lot of them were ripped up and replanted in a more modern way, with more saleable grapes for the time. A lot of the old vineyards were torn out in the 1970s to make way for Cabernet Sauvignon, which at that time was starting to be a really popular grape. Most of those old field blend vineyards were made up of grapes which you might not even recognize by name today, especially the whites. Alicante Bouschet is a red grape that was popular in field blends. That was a grape with a really thick skin; it was ideal for transporting back East from California. It also had very intense coloring, a very deep red, which allowed for it to be diluted quite a bit. It was planted pretty widely during Prohibition. "The wine produced from the field blend grapes is known as 'old-style Zinfandel.' It's the Zinfandel blends which are still viable these days. They didn't even call it Zinfandel - they called the field blend grapes 'mixed blacks' back then, a racist term. Field blends sort of fell out of vogue after Prohibition. You know, Prohibition was a real boon to grape growers back then. They could sell direct to the consumer. Commercial production of wine all but stopped, but people could still make up to 200 gallons a year for personal use, and a lot of people did." Economics played a big part in making field blends so common in pre-Prohibition California. "Fermentation tanks were expensive, made from redwood back then, and very expensive. There weren't too many big wine producers. Most of the wineries were little mom & pop operations, and they couldn't afford the luxury to have but one, maybe two tanks. Each tank held 2 to 3,000 gallons. They wouldn't keep the wine very long. They would press, then rack into barrels and then ship it in the barrels to a bottling plant. The barrels would be shipped back to the winery and the bottled wine was sent along to the negociante who purchased it. "So, since a winemaker knew he only had one tank, he'd figure if he wanted a blend he had to plant it that way. It was a much smaller scale we're talking about; smaller vineyards, all the plowing was done with horses so the yield was very limited. Old-time grape growers would plant the blend they wanted years before they would ever see a grape from it, they had the percentages of the different grapes all figured out. 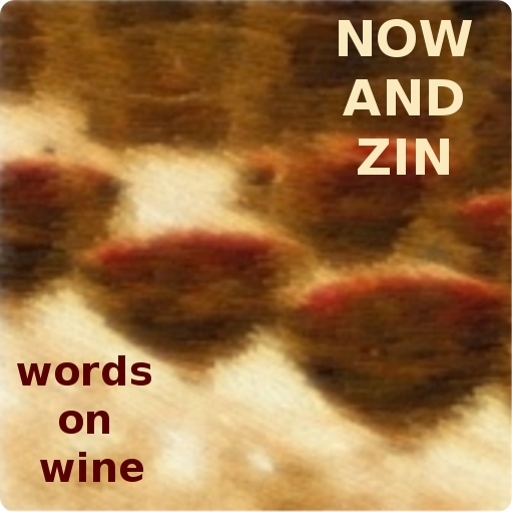 Zin likes to be ripe, but as the ripening goes on, acidity dwindles. Put some Carignane and Mourvedre in there for better acidity. Plant some Petite Sirah for intense tannins and color, to add density. Muscat is good for spiciness and aromatic qualities." Do you find that there is a big mystique or nostalgia aspect today surrounding field blends? 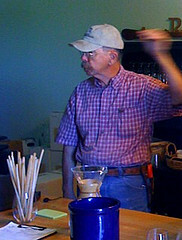 "Not really, I don't think most people know when they have a field blend in their glass. The "old vines" thing is what really grabs people, old-vine Zinfandel, but most people don't know that those old vines are actually a composite of different varietals. It's not their fault, though. A winemaker may not want to advertise the field blend nature of the wine, as it may raise a question of regulation: 'How much Alicante Bouschet is in that Zin you're selling?' Any wine from a 100 year-old vineyard is definitely a field blend, whether it's advertised that way or not. "It's not unheard of to have a field blend that's not actually planted that way. If a winemaker simply doesn't have enough tanks to go around, and there's a tank 80% full of one varietal, if a small lot of something else comes in he may just say, 'Oh, just put it in there.'" Besides Jim's property, there are only a few other field blend vineyards remaining in the Geyserville area. "They were probably all that way once. But the ones that have survived planted as field blends, probably a handful. My neighbors, Seghesio, have a vineyard even older than mine. I think it dates back to 1895. The Osborn family owns one in the Alexander Valley that probably dates back to that same time frame; the Ridge Geyserville Vineyard, probably a few more." Ancient vineyards are rather numerous around Sonoma, probably owing to the area's status as the birthplace of the California wine industry. Ravenswood, Ridge, the Bucklin family's Old Hill Ranch and Saxon Brown are but a few of the wineries that tout a field blend as part of their offerings. The Bucklin property is said to date back to 1885. D'Argenzio in Santa Rosa makes a Gewurztraminer which they bill as a field blend. However, their varietal listing shows it as 100% Gewurztraminer. Some producers - Bucklin and Girard come to mind - utilize the old term "mixed blacks" in their labeling, indicating that not everyone considers the phrase to be politically incorrect. They say that everything old is new again, and anyone who hangs on to their wardrobe long enough can tell you that the cycle of fashion swings in a circle. Field blends - once a standard in winemaking - may make a resurgance. But, in the old-vine vineyards of Sonoma County, they never really went away. Great article on the field blends. My grandparents, uncles and aunts grew field blends on Walling Road in Geyserville. They also sold grapes to all the Italian in San Francisco to make wine. Dad always mentioned though that the winemakers always ordered on box of Golden Shasta to throw in the blend. Glad you enjoyed the article, Shirley. My wife and I certainly enjoyed our visit there earlier this year and can't wait to come back! You have a wonderfully laid-back town there, with some really interesting folks! Great wine, too!